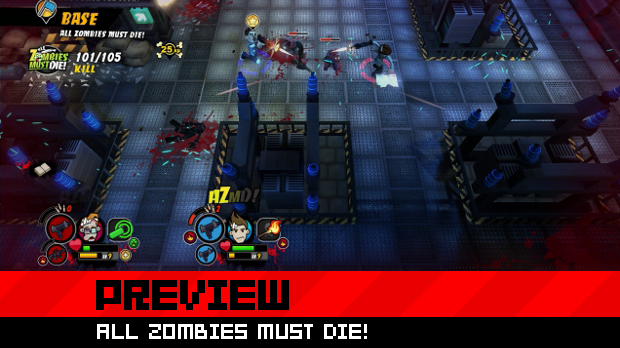 Preview: All Zombies Must Die! There exists quite a few rules which one must follow in order to craft the perfect undead apocalypse. Key ingredients include a small ground of survivors, weapons aplenty, and of course, it must be set in either a shopping mall or a small British village. 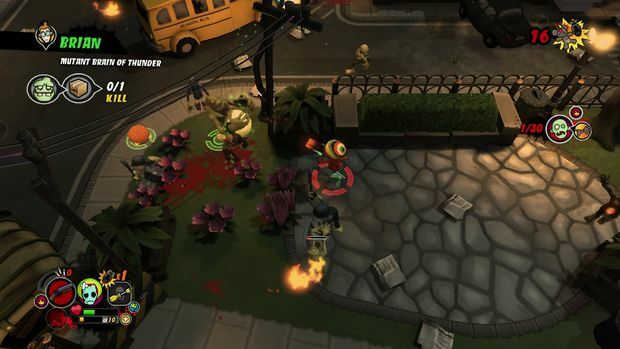 All Zombies Must Die!, the spiritual successor to Burn Zombie Burn, wants to give you all that and more in a quirky tongue-in-cheek zombie-hewing adventure on a gaming platform near you. From the creative womb of Double Six Games, All Zombies Must Die (AZMD) sees the players goal to, well, make all the zombies dead. You need not study the game for hours on end to discern that the creators of AZMD opted out of the usual atmosphere of hopelessness which permeates most zombie experiences. The commonplace aura of the undead which exudes horror and dread has its place in film and games alike; Nosferatu and Dead Space stand as classic spine-chillers for both mediums of expression. Conversely, films like Shaun of the Dead, lacking the overall air of gloom of the above mentioned silent film, are brilliant in their own right. With its pervasive humor and off the wall characters, AZMD hopes to bore its way into the lighter facets of your heart this fall much in the same way as Shaun of the Dead did in 2004. 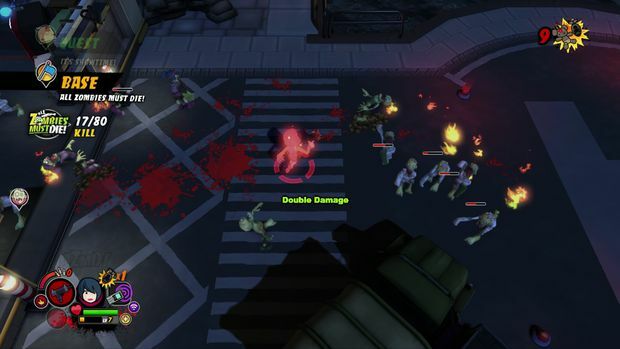 AZMD features top-down zombie slaughtering gameplay with arcade RPG features which add depth and meaning to the serious business of squashing the undead menace. A healthy arsenal of deadly weapons is of dire importance to the zombie formula. As such, Double Six has provided intrepid zombie hunters with several varieties of pointy sticks and shooters, some of which have awesome powers in the classical sense of the word. Flaming sticks, chainsaws and assault rifles are just some of the more mundane implements of doom which will be at your disposal. Then there are the special instruments of war like a cricket bat which punts zombies off the screen or a katana that, once powered up, allows you to move as a British Ninja should. Players also have the option of crafting weapons which are unique to chosen character. Rich in RPG features, AZMD features several characters with their own unique classes. Each character has their own story line which players may progress through in order to further their own understanding of the events which take place though the calamity. Two of the most humorous classes which comprise a portion of the playable characters are the Alien and the Girl. That's right, girl is a class. The Alien, named Luxo, is a traveler of the cosmos and a visitor from another world. Luxo's story is that of many American teenagers, he learned most of his English from The Big Lebowski. I'm not joking, at some point in his story line, Luxo gets hold of a copy of The Big Lebowski and crafted his persona in the likeness of The Dude. As well as unique storyline, each character has their own take on a special weapon. The girl, for example, can combine her cell phone with a mega phone in order to stun zombies with a deafening palaver about shoes and who at the office she hates the most. Elements of the RPG genre can be found all around this arcade style arena-shooter. Quests, crafting and leveling all attempt to fill the void which can often plague similar games. Leveling allows players to modify stats such as health, damage and speed while crafting gives them access to new and unique weapons. All of this is designed to come together and provide the player with a feeling of persistence and to add a level of importance to the events the player takes part in. For those who played Burn Zombie Burn on the PlayStation 3, you should be familiar with the concept of burning things without letting your inferno get out of control. AZMD takes that concept of controlled arson and runs with it. Whether you prefer to burn your zombies to a crisp or irradiate them until little remains save a puddle of goo, AZMD has you covered. Just don't lose control or you may find yourself staring down the gazes of several mutated freaks. AZMD allows you to change the "state" of a zombie in many ways. This is accomplished by applying various types of debuffs such as fire, radiation or exposing them to extreme levels of acoustic energy. 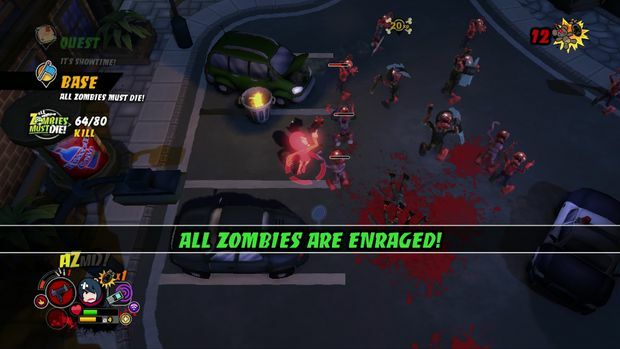 Each individual status effect is achieved by using a specific weapon and has varying effects on zombies such as damage-over-time and they can even slow the zombies as they advance upon you. Applying a status effect will also alter the types of power-ups dropped by zombies. AZMD will allow you and your friends to hack, slash and electrocute hordes of ravenous undead in a two to four player local co-op mode. Now don't go thinking that bringing in your gaming sidekick will make the challenge any easier. AZMD promises to scale the size and difficulty of the zombie hordes based on the amount of users present at any given time. All Zombies Must Die hopes to offer a few laughs and multitudes of zombies to kill come this fall when it officially releases. Developer Double Six has pledged continuing support for the title through numerous DLC and considers the game a long term proposition. AZMD looks to be a fun little title to burn the midnight oil with and in all honesty, it plays quite brilliantly.